The EFFO team has trained medical staff and nurses in Rwanda several times. As a neighbouring country to the Democratic Republic of the Congo, this region is at increased risk of being confronted with Ebola. Participants of the simulation exercise enter the temporary isolation area. Observers of the exercise are in the background. The aim is for the participants to pass on their acquired knowledge to other colleagues. 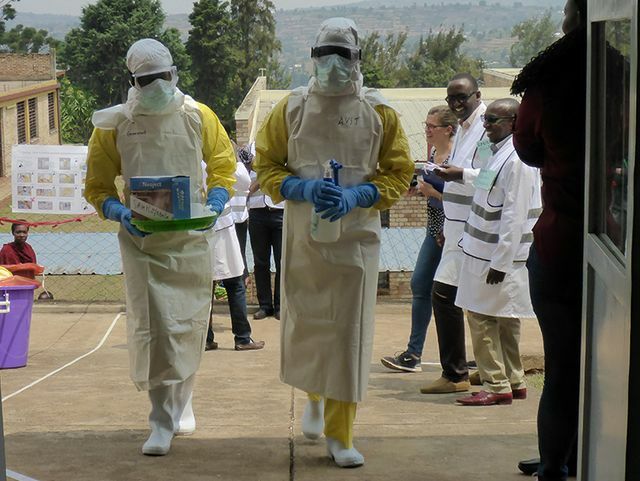 Key aspects of the five-day training course include how to recognize suspected cases of Ebola, how to handle personal protective equipment, as well as learning and reflecting on 'EFFO didactics', among many other topics. In August 2018, staff at the Butare University Hospital practised plannable procedures and unpredictable situations with a simulated patient. Observers from Rwanda and Germany documented the noted strengths and weaknesses for later evaluation in a joint workshop. The simulation exercise is part of the train-the-trainer programme.